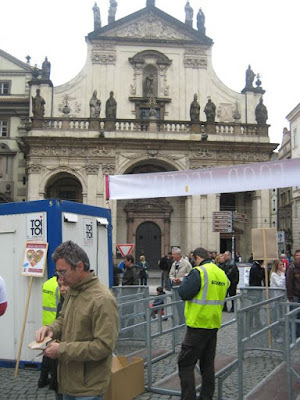 This was my second year at the Prague Food Festival. 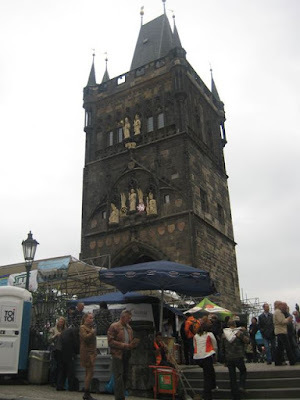 It was in a new location, at the foot of the Charles Bridge and the embankment below on the Old Town side. I paid the 350 CZK entry fee. 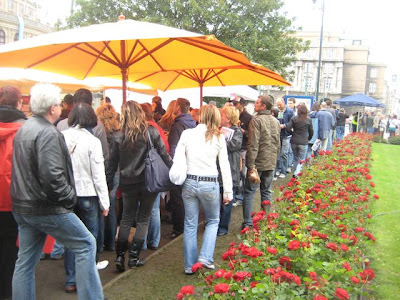 Included in the price were ten food coupons worth 25 CZK each. 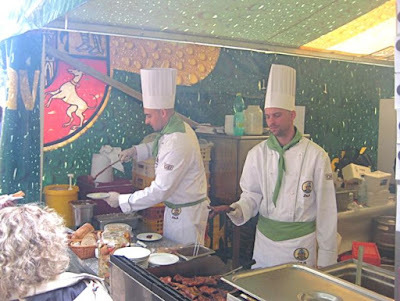 The coupons are called Grands because the festival is organized by Pavel Maurer, who produces the Grand Restaurant guide. 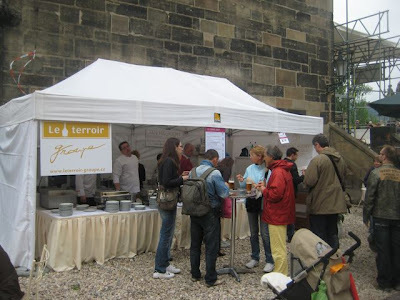 I entered near the bridge by the St. Salvator church and saw the tent for Le Terroir, which was awarded the Bib Gourmand by the Michelin Guide. I'd always been curious about this place, but to be honest, the high prices put me off. 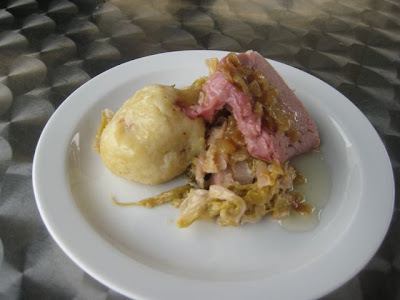 For four Grands (100 CZK), I had the warm ham off the bone with Savoy cabbage and a potato dumpling. It was OK, but given the restaurant's reputation, I was not impressed. The ham was tender, but quite salty and not very distinctive in taste. The cabbage was relatively bland. So was the dumpling, which had a little chunk of ham in the middle. 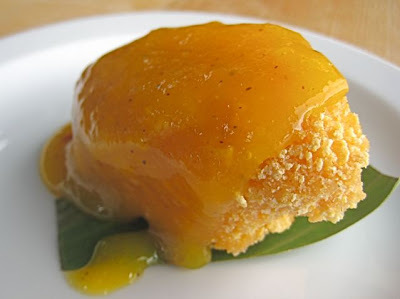 I've had more pedestrian pub versions of this dish that I've enjoyed more. I wandered around and realized there weren't very many tents. I asked a staffer where the rest of the festival was. "You have to take a boat further down the river. 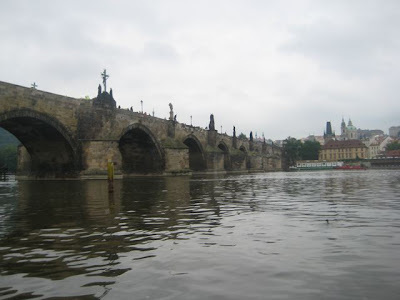 They leave regularly from below the Charles Bridge." "Can't I walk? It's like 200 meters. I can't go out and and come in at the other entrance?" Fearing the worst, I made my way down to the water. My fears were unjustified. It was very well organized. A sailor played an accordion to keep me entertained. 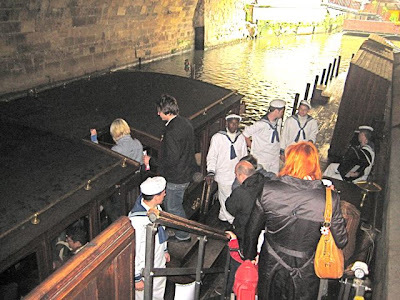 They had many boats constantly moving through. I got right on and it was only a minute before we were underway. 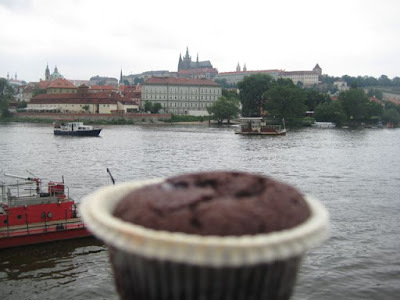 It was a charming little trip with spectacular views of the Charles Bridge and Prague Castle. We came ashore, and I was attracted to the Corinthia Hotel's tent by the water. They were doing Asian fare. 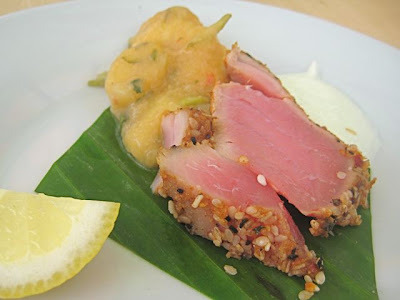 I had the seared, pepper-crusted tuna with banana chutney and wasabi mayo (100 CZK). I loved this. Tuna, which can be bland on its own, was well-boosted by the crust. The chutney was very sweet and mixed with a little cilantro. Yum! The tangy mayo had a nice kick. I didn't even need the lemon. I'll jump ahead and tell you I went back at the end to try their dessert. 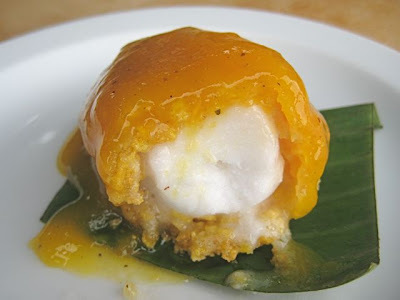 It was fried vanilla and aloe vera ice cream with a mango chili coulis (75 CZK). This invention was interesting but less successful than their tuna. It deep fried to order. The crunchy shell was the best part. The coulis -- let's call it sauce -- was good, but I could hardly detect any chili, let alone heat. I couldn't really taste vanilla. The aloe gave the ice cream a fruity flavor. The biggest problem was it was more like a sorbet -- ice crystals all the way through and not creamy at all. Too bad. I walked up to the main festival area. It was super crowded. It seemed there was less space than the previous year. 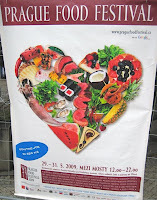 I also wrote about the 2008 festival on what is known to many as Žofín Island, close to the National Theater. I don't know how the attendance compares -- I was there during Sunday lunch both times -- but the pathways were certainly wider. This year, the lines were longer, though they usually moved along relatively well. But it was really hard to move without getting stuck behind masses of people. It did thin out somewhat after 4 p.m. 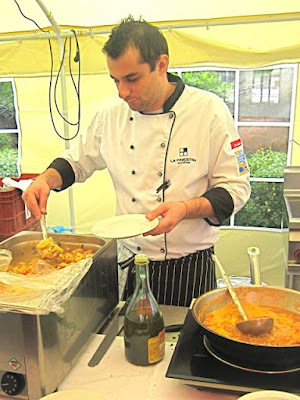 I went to Aromi's tent and got their potato gnocchi with shellfish (175 CZK). It was a reasonable portion, but one of the more expensive dishes. There were clams, calamari, and part of an overcooked shrimp in mine. 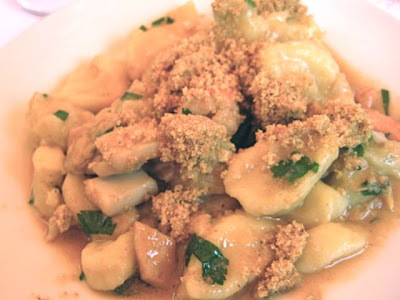 The gnocchi were delicate, but some bordered on mushy. They put bread crumbs on top that were extremely salty and upset the balance for me. The sauce tasted of the sea, but the long-stewed seafood was more about texture than flavor. I hate to say it, but my favorite part was the fresh parsley. It warmed me up on a cool, gray day, but that's about it. Next, I went to the tent representing V Zátiší and Bellevue. Zátiší was one of my favorites last year and so it was again this year. 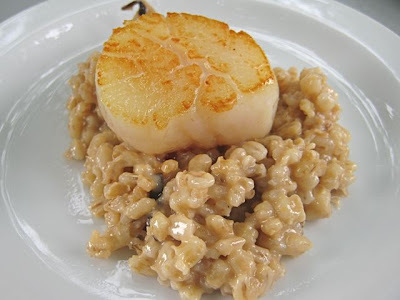 I had the crispy scallop with barley risotto and garlic sauce. (100 CZK). 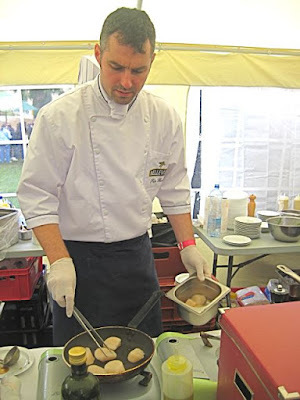 The scallop was huge, and I had the pleasure of watching it cooked in a pan. The flesh was extremely delicate and just the right level of salt. 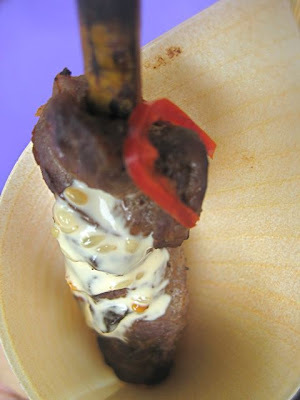 The barley was pleasantly chewy, a very unique accompaniment with the aroma of shiitake mushroom in the mix. There was one tell-tale slice visible. The man eating the same thing next to me clearly enjoyed it as well. Next up was the Švejk Restaurant Malostranská Pivnice. 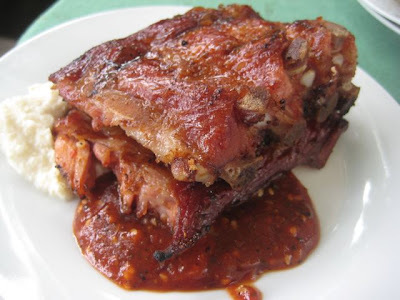 I saw lots of people with their little smoked pork ribs and wanted to try them. They were small, but I got six bones for just 50 CZK, perhaps the best bargain of the day. It came with Czech-style sweet barbecue sauce and horseradish. Unfortunately, they were disappointing. One set of three bones was way too salty. The salinity level of the other set was fine, but those were dry. Going to Cloud 9 cocktail bar at the Hilton Hotel is on my "to do" list. At their tent, I watched them roughly mixing cocktails in plastic cups with spoons, but felt no thirst. I need it in a glass. I ordered one of their peppered beef satay skewers (50 CZK). It was served in a little paper cone. The beef was marinated in soy sauce and had sesame mayo. It was probably much better when it was fresh off the grill, but by the time it got to me, it was barely warm and a little dry. I was running out of stomach space -- fast. But I almost always seem to have room for dessert. Especially free dessert. Apetit magazine was giving away really good mini chocolate desserts. There's probably a fancy French name for it -- I didn't ask. I will call it a cupcake. It had a lovely, tart, berry... uh... sauce in the center. There was lots of wine and champagne available. But I had beer. 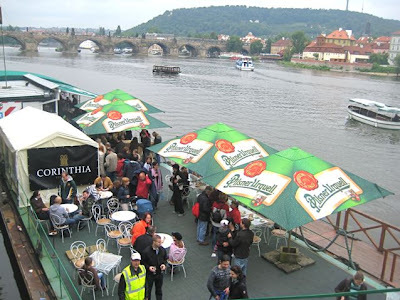 I stood on the long line and had a .3 liter glass of Pilsner Urquell (25 CZK). 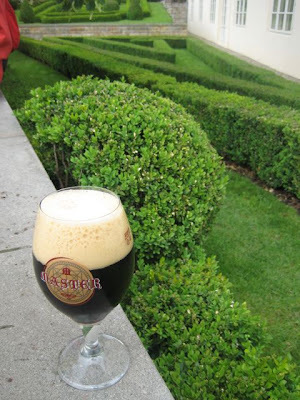 I also had .4 liter glass of Master 18° dark beer (50 CZK) from the same brewery. It's pretty strong, but I like it. It has a slight coffee flavor to it. Overall, I'd say I didn't enjoy the festival as much this year as last year. The weather was certainly a factor -- there were beautiful spring days in 2008. And V wasn't with me this time. I didn't like this year's food as much. I did want to try the offerings from the Radisson SAS Alcron and Alchymist hotels, but I was too full. Some good restaurants didn't participate on Sunday. Maybe I made some poor choices and missed some good stuff. I'm sure others may have eaten better than I did. What was positive? The scallop and the tuna, certainly. The boat ride was fun and the views were better. 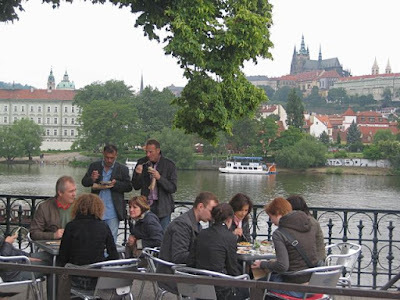 In total, I paid 850 CZK and got to sample the cuisine of several high-end establishments without having to spend much more than that at each place. I know more and more people have been discovering this festival. That could mean greater demand for good quality restaurants, and that's a good thing. However, I really have to underline this: the crowds, lines, and tight confines seriously got on my nerves. If the festival organizers are lucky, the weather will be better next year. And if they are wise, they'll move it to a place with more space. I agree, last year the food was more enjoyable (this year I went on Friday and Saturday)....and for disabled people or parents with baby carriage it must have been a nightmare. I'm going to be VERY unfair here. I will base my comment only on what it's written above. 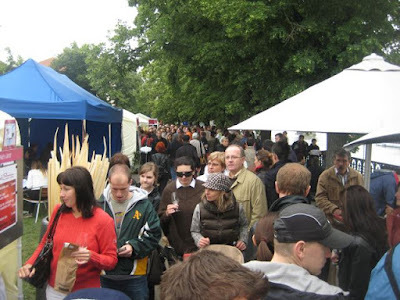 This festival is supposed to be a promotional event for top of the range restaurants. They are there showing how good their food is hoping that some of the attendants that don't know them will consider paying them a visit in the future. Yet it seems to me that in average the food was all that good. What about The Four Seasons's stand? It was awesome. La Cicala's? Yum. I went with a friend who got the required invite (for the first day) and we scoped all he best places on the pamphlet before we started; strategic eating, I guess. Same as you, I was full up in about 45 minutes. But the food I had was FABULOUS. Decent wine, tasty food. Were you there on Sunday? I did not see either of those two restaurants listed on the map or website. Brewsta, I've since been told that some of the stands changed daily. I only went on the first day (the invite-only one), so perhaps Four Seasons and La Cicala weren't there after that? The boats took us directly to the Four Seasons's courtyard; did they really not have another stand after the first day?? ?